Honda Four-Stroke Engine Design: The BF20s utilize a 350 cc, 2-cylinder, in-line, OHC design powerhead. World-renowned Honda quality combines proven reliability and quiet operation with no gas-oil mixing. Pendulum-Motion Vibration Dampening: An exclusive Honda feature, the pendulum-motion mounting system for the powerhead helps absorb the vibration, including longitudinal vibration, which was difficult to reduce successfully by conventional rubber mounts. The pendulum mount does this without the use of a heavy balancer shaft, which also significantly reduces overall weight. Increased Reverse Thrust: When reversing, the exhaust gases are diverted through additional exhaust relief ports above the cavitation plate, allowing the propeller to back up into clean, bubble-free water, thereby increasing reverse thrust. Complete Engine-Management System: Electronically controlled monitoring system protects the engine components from over-revving, low engine-oil pressure and overheating. Regulated Charging System: A high-quality regulator/rectifier is standard on all models to prevent overcharging the battery. Fresh Water Flushport: Allows easy hook-up to fresh water supply to flush debris and salt water out of the engine, extending the life of the outboard (optional Flush Kit required). Shallow-Water Drive: Allows you to run in shallow water with the engine raised to reduce the risk of damage to the lower gearcase. Three-Year Warranty: The best outboards are backed by the best warranty, 3 years parts and labour. Lightweight, Rounded Design: Easy to transport, ideal for 12-16 ft. fishing boats, inflatables and pontoon boats especially, with remote-control power-tilt models available. Rounded ergonomics won't catch fishing lines as easily. Easy-Pull Starting: The programmed-ignition system sets the ignition system during start-up to reduce the effort required to pull start the engine. Forward-Mounted Shift Lever: Allows more control and comfort in shifting. Quick-Twist Throttle Friction Adjuster: A simple twist of the throttle friction collar located right at the throttle grip allows you to adjust the throttle tension up or down, minimizing driver fatigue. Front-Mounted Steering-Friction Adjuster: A new quick-adjust lever design located just above the transom bracket allows for precise adjustments at your fingertips. Integrated Carrying Handle: A convenient, foldaway carry handle is situated at the exact horizontal balance point of the engine so that the engine carries more easily in a level position. Long Tiller Handle: The BF20 tiller models use a long tiller handle for increased control and reduced steering effort. The tiller handle is also made of lightweight composite for increased strength and weight reduction. Standard Fuel Tank, Hose and Propeller: A 12.5-litre fuel tank, fuel hose and aluminum propeller are included as standard equipment. Auto-Choke System: An automatically controlled start-up fuel-enrichment system ensures optimum air-fuel ratio to the engine, eliminating the chores of choke operation and greatly simplifying engine start-up. High-Output Charging System: All electric-start models are fitted with a high-output charging system that will deliver an amazing 12 amps at only 3,000 rpm to keep your electronics working and batteries charged. Displacement: 350 cc / 21.4 cu.in. Oil Capacity: 1.30 L(1.14 Imp. qt.) with oil filter repl. Trim Range: 4-Stage 8 deg.-12 deg.-16 deg.-20 deg. Overall Width: 350 mm / 13.7 in. Transom Height (S-Type): 432 mm / 17 in. Propeller Diameter x Pitch (S-Type): 235 mm x 254 mm / 9-1/4 x 10 in. S-Type: 46.5 kg / 103 lb. 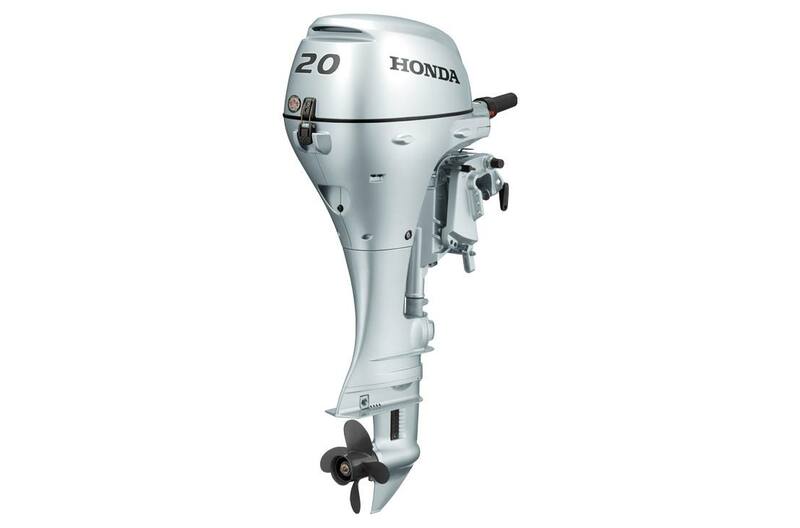 Honda outboard motors are power rated in accordance with NMMA procedures using the ICOMIA standard 28/23. Value does not include freight, pdi and applicable taxes. 4-Stage 8 deg.-12 deg.-16 deg.-20 deg.